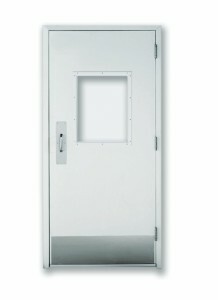 Single Swinging Laminated Fiberglass Power Door | Dock Door Systems Inc. Using cutting edge technology and exacting quality, Excel swinging doors have surpassed market demands and exceed cGMP, FDA and EMEA requirements. 16 ga., 304 #4 stainless steel, face welded andpolished. Pushplate to open; time delay to close.In case of power failure, door can be opened manually at any time. UL fire rated.Knock-down frame of pultruded fiberglass construction. Hospital stops 4” or 6”.Stainless steel closer cover.